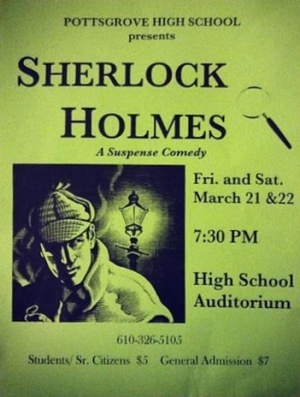 Sherlock Holmes, A Suspense Comedy is an American play performed by the Pottsgrove High School Company in the school's Dr. Richard J. Radel Auditorium (Pottsgrove, PA, USA) on 21 and 22 march 2014 (3 performances), starring Jake Deska as Sherlock Holmes and M. J. Bird as Dr. Watson. 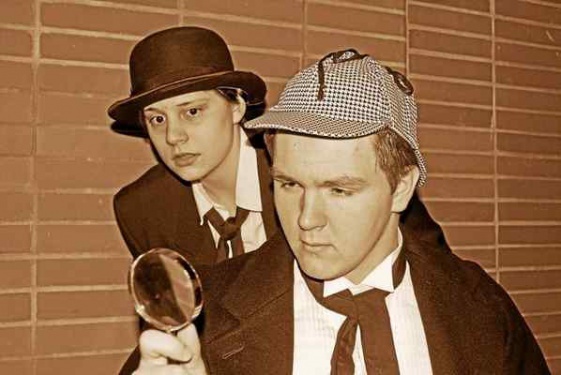 The play combines elements from Arthur Conan Doyle's short stories : A Scandal in Bohemia (1891), The Hound of the Baskervilles (1901) and the 1899 William Gillette's play Sherlock Holmes. Sherlock Holmes and Dr. Watson are attempting to recover incriminating letters for an insurance company. What starts out as a simple case of blackmail evolves into a much more complicated scheme that pits Holmes against his arch nemesis, Professor Moriarty. Alice Faulkner, who has the letters, is kidnapped by the evil James and Madge Larrabee until Holmes rescues her. A budding romance between Alice and Sherlock is threatened by the expected armed thugs, time bombs, and other complications. The play combines both mystery and humor to reach a satisfying resolution. Other roles : Andrew Bayless, Brianna Beitler, Emma Burrus, Ashley Cole, Cierra Fekelman, Sydney Hernandez, Kendra Houck, Mollie Marko, Tayler Nofer, Shelby Poston, Nicole Raimondi, Anthony Romano, Rebecca Smith, Michael Thornton, Josh Toth, Hailee Tyson, Dan Weand, Allison Wentzel, Hannah Windrim and Jake Witty. This page was last edited on 22 December 2017, at 15:52.